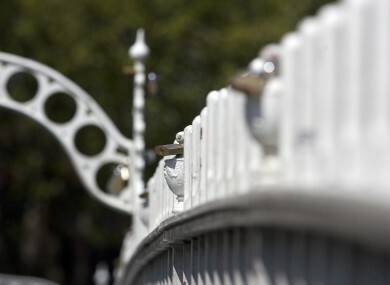 'Love locks' on Dublin's Ha'penny Bridge. The council has asked couples not to add any more as they could damage the structure. Fine Gael have said the situation of Longford mayor Jim Keogh is “under review”, after he revealed that he would be voting against the treaty in defiance of his party. Businessman Declan Ganley has officially launched his campaign against the fiscal treaty, saying the agreement does not address the issue of Ireland’s bank debt, RTÉ reports. A group of independent TDs and an MEP have called for the referendum to be delayed. And if you haven’t registered to vote, it’s now too late: today was the last day for inclusion on the supplementary register. Going anywhere this weekend? If you’re flying with Ryanair you might want to check in online now – the airline has said its website will be down for much of the weekend, with anyone who hasn’t completed online check-in facing a €60 fine. Amid continuing uncertainty over the future of Greece, Michael Noonan has urged its political parties to overcome their differences and form a coalition. The co-founder of Facebook has renounced his US citizenship just days ahead of the company’s IPO. Meanwhile, here are eight things you may not know about Mark Zuckerberg. Ireland’s students are set to vote on whether to abandon their opposition to third-level tuition fees. The survivors of the Utoya island massacre in which more than 70 people died have described their desperate attempts to escape gunman Anders Behring Breivik. TDs and MPs in the British-Irish parliamentary assembly have weighed in on the debate over the future of RTÉ’s London office, calling on both governments to support the case for maintaining the bureau. Bones have been exhumed from a crypt in Rome as police investigate the disappearance of a Vatican employee’s daughter. What are you up to tomorrow? If you’ve got a camera, you might want to check out this global crowdsourcing project. And finally: may we present a three-year-old child who is cooler than you or I will ever be. And enjoys the music of Nirvana. Email “The Daily Fix: Monday”. Feedback on “The Daily Fix: Monday”.